Ah gnocchi. 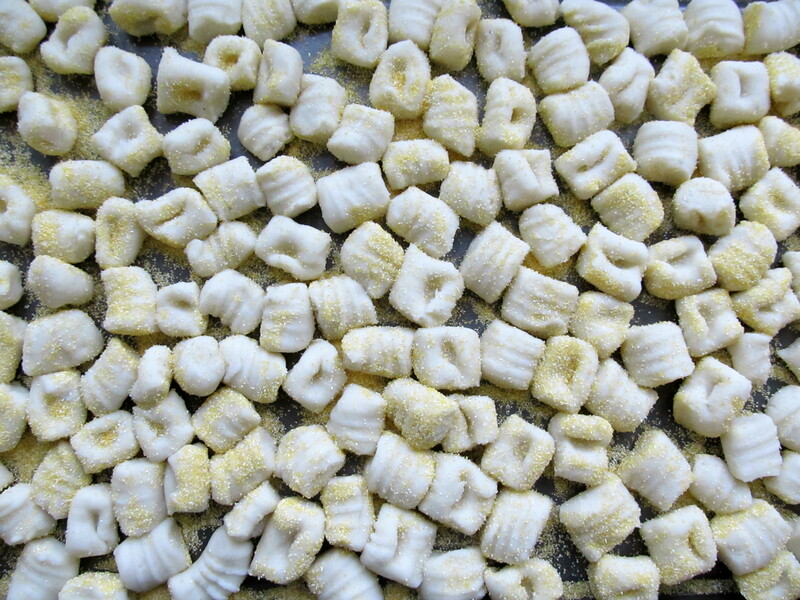 When gnocchi is made right they are like light and airy pillows; when made wrong like heavy and dense globs of potato. They are one of Cheryl’s favorite foods and always in the running if we’re at an Italian restaurant and gnocchi is on the menu. Gnocchi are made with the simplest ingredients, potatoes and flour, but you have to get the ratio correct. It’s a fine line between glob and pillow. Unfortunately for me the standard by which Cheryl judges gnocchi is a dish she ordered when we were in Milan (and Como) on our very first trip abroad together. And yes, I did pick those cities to romance her a bit. (It worked.) One night we went to a local restaurant near our hotel in Milan and she ordered gnocchi in a saffron sauce. To say these were the lightest pieces of potato I’ve ever had in my life would be a vast understatement. Since then I’ve spent some time trying to get close to those gnocchi but the dough I’d make would usually end up as one big gooey sticky ball where I’d be forced to add more flour and then I’d end up with the heavy gooey blobs. So how’d I suddenly have some success? Used a ricer. Honestly, I really think this makes a huge difference. (Um, kitchen essential perhaps?) The ricer “minces” the cooked potato in a way that you get a greater surface area for the water to steam off. Prior to this contraption joining my kitchen I’d just mash the potatoes lightly with a fork, or grate on a box grater, none of which work as well as the ricer. Or so I hypothesize. A couple of weeks ago I decided to give gnocchi another try. I felt pretty confident that with my new tool this would be the time it all worked. Sure enough, it did. And just to be certain the technique was right I attempted it again last week and successfully replicated the experiment. Making the gnocchi is actually pretty easy when you have the dough right and based on my two successful hypothesis tests it seems like a 2:1 ratio of flour to potatoes works well. I had 2.8 lbs of potatoes in this batch and used a little less than 1 ½ C of flour. Instead of using an egg to help bind it all together I used some ricotta cheese. 2-3 pounds of potatoes will give you plenty of gnocchi for 4 people. Wash and scrub the potatoes. Place potatoes in a large pot of water and cover with water. Place on stove and cook over medium-high heat until fork tender, about 45 minutes. Remove from water and drain. Allow potatoes to cool a bit so you can handle them. Peel the skins off the potatoes. On a large sheet of parchment paper press the potatoes through a ricer, or grate them on a box grater. Allow to cool completely. The object here is to have a layer of pressed/grated potatoes on the parchment paper so moisture can evaporate. When the potatoes have cooled pick up the corners of your parchment paper and flip the potatoes onto a cutting board (or even your clean counter) and make a small mound. Dust the mound with 1 C of flour and add the ricotta. Mix well with your hands and form a dough ball. Knead it gently, gradually adding the other ½ C of flour as you knead. Keep kneading gently until the dough forms a smooth ball, around 5 minutes. Invert a fork on your cutting board so the tines are facing down. With your thumb pressed gently in the center of the gnocchi roll the gnocchi down the back of the tines toward the cutting board. Place gnocchi on a polenta/corn meal dusted cookie tray. Repeat, repeat, repeat. Drop in boiling water. When they pop to the surface they’re done. You can either cook them in batches and chill immediately in an ice bath, then freeze or save for later. Or just cook them up in batches and eat with your favorite sauce! Ha! yeah the ricer also makes great mashed potatoes too. no lumps. glob or pillow. so well said!!! Yours look absolutely beautiful. congratulations. I’ve yet to make them. Thanks! It feels good to finally get it right, or at the very least, much better than they used to be. Love, Love, LOVE homemade gnocchi. So true. It can also be fun eating the mistakes.